ID Tech Solutions is one of the major manufacturers and suppliers of high quality plain white plastic cards in, New Delhi, India. 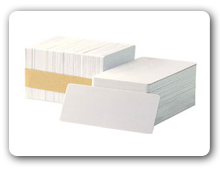 Our Plain white PVC plastic cards are the highest quality, ultra fine cards available in Delhi and across India. We guarantee that all our blank cards will print in any regular business card reader they are put into. Also, we offer a quick delivery time. These PVC cards can be used to make: Plastic Gift Card, Plastic Business Card, Plastic ID Card, Membership Card, Loyalty Card, Fundraiser Card, School ID Card, Photo ID Card, Photo ID Badge, Any ID Badge or ID card.